The Cowley College Visual and Performing Arts Department would like to invite the public to its upcoming spring recitals. There is no cost to attend these events. A vocal recital will take place on Tuesday, April 25 at 7:30 p.m. in the Earle N. Wright Room, while an honors recital will be held Thursday, May 4 at 7:30 p.m. at the First Presbyterian Church in Arkansas City. 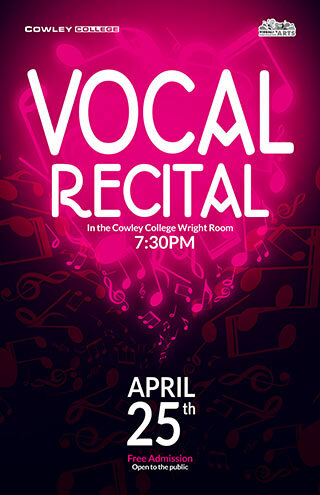 The vocal recital will feature Cowley vocal music students who have been studying voice this semester. During the school year members of the Cowley Concert Choir have the opportunity to study privately with vocal instructor Lindsay Allen or director of vocal music David Smith. This weekly one-on-one time helps solidify healthy vocal techniques and gives students the chance to perform weekly in an informal setting for peers. Each semester culminates in a recital that showcases the hard work that the students have put into their private study. The honors recital will feature vocal and instrumental music students. Instrumental students have had the opportunity to study with director of instrumental music Evan Ricker, Tyler Gauldin, or Aaron Fisher. 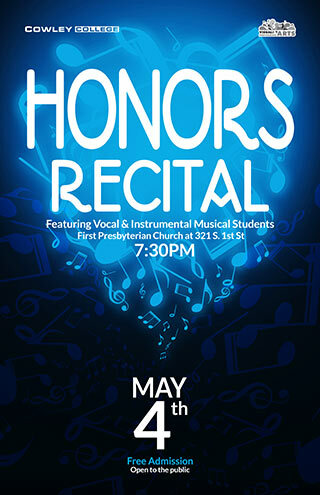 Students who are selected to perform at the honors recital have shown dedication and hard work throughout the school year and will be featured at this special event. The First Presbyterian Church has graciously allowed Cowley to hold the honors recital in their sanctuary. “While each of our students in private lessons have shown great improvement, this special recital showcases those who have gone above and beyond in their studies,” Lindsay Allen said. Recitals will feature a wide variety of styles including opera and musical theater. Pieces from Handel, Schubert and popular musicals such as Les Miserables are just a few of the varieties that will be performed. Both recitals will be accompanied by Sherryl Determann.